Laser toner cartridge for Samsung printers, replacement, yield: 15000 pages at 5 % coverage, Supreme version ActiveJet toner cartridges are high quality consumables for laser printers and copying machines. They are an attractive alternative for users who want to make a significant cut in the copier or printer ownership costs. Some ActiveJet toner products are manufactured using recycling technologies. Once emptied, the cartridges are disassembled and their technical condition is carefully examined. The parts which pass the disassembly check successfully are subsequently sent to the production line where full value toner cartridges are built. The cartridges pass detailed quality checks at each stage of their manufacturing process, which is kept under strict professional technical supervision at each of its steps. Finally, each cartridge manufactured passes an extremely restrictive print test. That procedure guarantees that our cartridges ensure the best quality of print. All our products come with the following quality guarantee: - actual number of pages printed shall be consistent with the yield we specified, - print quality shall be at least as good as rendered by the OEM cartridge, - guaranteed safety of printer use. Activejet toner cartridges are well known for their performance and excellent quality. Black toner products give extremely high density of black and the colour toner cartridges amaze with accurate colour rendering. All toner cartridges are rigorously tested for their quality, which means they are safe and trouble-free to use. Their key components are sourced from several reliable sources, including manufacturers from Europe and Japan. 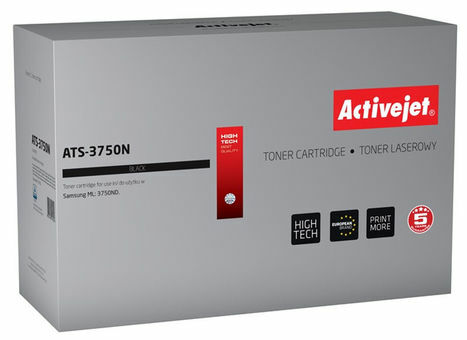 Activejet toner cartridges are a great choice for anyone looking for quality laser print. Activejet is the leader of the Polish market of laser printer supplies.